Our third day was spent at Hollywood Studios which is home to two of our favorite rides; The Tower of Terror and Rockin' Roller Coaster. Both are extremely fun and I have to take a motion sickness pill before both of them (yes, I am officially that old). We spent the morning riding rides, then we ate lunch and watched a couple of shows. I made sure to watch the Little Mermaid show even though I have already seen it twice and the theater was filled with 3 year olds. The Little Mermaid will always remain my #1 Disney movie (with Lion King in a close second). I'm pretty sure Luke and my dad slept through the whole show. I made sure to reprise "Part of Your World" for them later in the day. At some point during the day we stopped to take pictures in 'New York City'. Luke, Kati and Haley waited for 30 minutes in line to ride the Star Wars Tours, which they all agreed was severely out of date. I refuse to EVER speak any ill of Disney World, so please remember, those are their words not mine. While they were on the ride My mom, Dad, and I hung out with Maxton. Here he is on some Star Wars Creature: How we got him to sit still for more than 1 second I will never know. And here he is talking to me, he talks in the cutest baby gibberish, I need to get it on video: Later in the afternoon we watched The Little Mermaid show. After it was over we walked outside to a Monsoon. It was pouring down rain! The funniest thing about rain in DW is everybody just continues on with their normal routine. 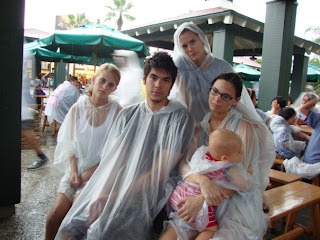 You buy a poncho and then move on and ride rides and eat food. Later after we had enough of being wet and cold we headed back to the hotel where Maxton modeled my dad's "reading light" for us. Can you tell we just can't get enough of this little guy? He has 5 adults surrounding him and basically catering to his every need. He's not spoiled at all!!! We didn't let a little rain spoil our fun. It was a great day! What a fun trip and Maxton is too cute!! I looooooove Tower of Terror! Seriously how great is the rocking roller coaster and the tower of terror. I think Tower is my favorite. I was screaming my head off! We totally missed the Little Mermaid show and I'm so sad about that. Love the Little Mermaid. "Look at this stuff..isn't it neat..." hahahaha! Maxton is so adorable! And your pictures are fun :-) thanks for sharing girl! I would have refused to spend money on a poncho too! haha! Maxton is sooo cute! I love all of your pictures--it's so fun to visit Disney through you! those ponchos crack me up! Maxton is so darn cute! Maxton looks so cute on that SPEEDER BIKE!! :) We are Star Wars nerds over here. 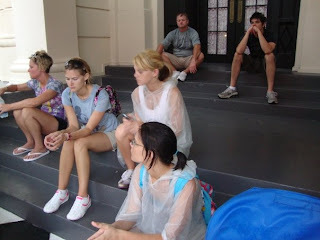 Anyhow, fun times except for the rain, UNiversal is so fun, I am ready to go back! Oh my gosh I don't know what's cuter, Maxton in the reading light or the baby poncho! I could eat him! And I mean that in the most non-violent way possible. We've never been to Hollywood Studios, but I would love to. Looks like fun!! Yay for DW recaps!!! Love all the pictures!! That picture with the ponchos is classic. Ya'll are a hott. Um, that would be HOOT. Although, in reality, ya'll are hott. Now I'm the one who wants to go back after only just being there. 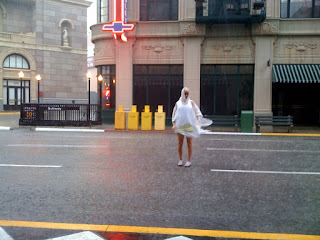 :) But no, seriously--Hollywood Studios is one of my very favorite parks. And we had to catch the Little Mermaid too!! One of the "Ariels" is a girl that was in our sorority in college!